Birthday party a wild BASH!! Can you believe it? It’s already been a year since we opened our doors! We have had so much fun producing over 10 different types of mead. Not only have we made lots of mead, but we’ve also made lots of friends, as was proven by our recent one-year anniversary party at the Meadery. We had well over 200 people show up and went through cases upon cases of mead! 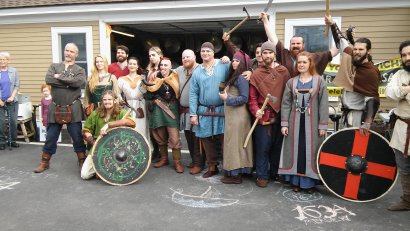 We had everything from face painting by Shirley Berry, history tours of 1634 cemetery by Gordon Harris, a bee hive display by Sarah Rydgren, a lovely honey tasting station with educational talks from Eric Josephson, and an epic combat show put on by the Viking Irish combat group. The tours of 1634 Cemetery were put on by Gordon Harris. 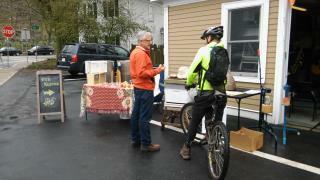 He was previously the chairman of the Ipswich Historical Commision and currently runs the “Bike New England” website. He’s got a world of knowledge and is a very knowledgable person. We have such involved customers that one of our own Mead Clan Members started some beekeeping of their own. Sarah Rydgren and her husband DJ, of Salem, MA, have started their own small beekeeping hobby and brought some great displays to the party. We got to see the ins and outs of where we get that wonderful gold substance we turn into mead. 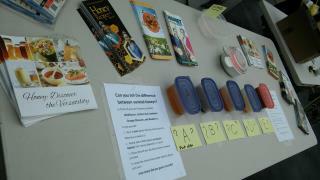 Our tasting station included five different types of honey to sample and guess what type they were. It was quite the tasty game! This went hand and hand with Eric Josephson who owns the Marshview Apiaries in Ipswich. He spoke of the fantastic work that bees do for the environment and how important they are. He does his own beekeeping and regular educational talks. W e also had the wonderful musical talent of Michael Bernier, a local musician who had played in the same shows as Guster, ‘Weird Al’ Yankovic, and The B-52’s. He brought a great vibe to the party and had people dancing. Check out his music online, he’s a great musician and Master of ceremonies. And finally the Viking Irish Combat Group. My goodness, they were epic. That term is used far too often these days, but they earned this one! They put on an excellent show right in front of the Meadery. The outfits were exquisite, the weapons and swords were well worn, and the battling was intense! But most of all they were really fun to have around! You could even buy some of their plunder including drinking horns and t-shirts! Check them out on their website as well, they could be at your next party! Thank you to all the vendors/exhibitors that showed up and helped us celebrate! Finally, we would like to thank you - our customers! 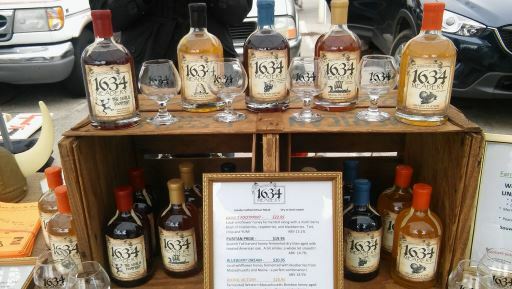 Everyone that follows along with us on social media, comes to hang out at events or farmers markets, and the people that just stop in to grab a bottle now and then. We work very hard to make delicious mead and couldn’t be happier that you enjoy it so much! We are continually trying different flavor combinations and can’t wait to share them with you. If you love our mead as much as we do, please share our story with your friends and family (we know it’s hard to share the mead). Join us at a local farmers market! 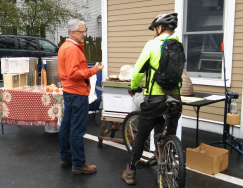 Our meadery will be joining the crowds of people in Massachusetts that help support local agriculture, crafts and libations by attending local farmers markets. Email or call to see if we are attending on a specific week.